Duff Quarry is home to a small piece of Logan County history; two pieces in fact! Two arches stand in front of the Duff Quarry headquarters in Huntsville, Ohio. These arches have an interesting history dating back to the 1964 World’s Fair. The 1964 World’s Fair was held in Flushing Meadows Corona Park in Queens, New York. Hailing itself as a “Universal and International” exposition the fair occupied nearly a square mile. Fifty-one million people attended the fair with exciting attractions of national and international origins. Some of the most notable attractions were the Unisphere, Museum of Masterpieces, and the Belgium Village (Where Belgium Waffles originated). During the fair, General Foods built eleven arches scattered about the World’s Fair grounds that served as an information kiosk and as a rendezvous destination for fair goers. Unfortunately, after the Fair the company sold off or scrapped the arches with only a few known to still exist in the country. World’s Fair enthusiasts have found other original arches in West Hempstead, New York; Rocky Point, Rhode Island; and a few in New Jersey. While many never traveled far from home or were scrapped; two arches made their way to Russell’s Point, Ohio. 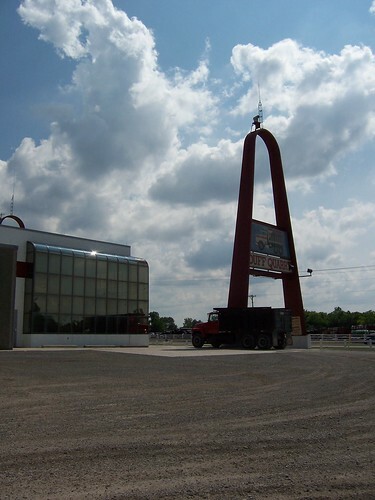 During the 1960’s, Indian Lake Playland Amusement Park brought the arches in by railroad with plans to eventually erect them at the park. However, the plans never came to fruition leaving the arches sit in the weeds for over twenty years. Over the years the arches fell into the hands of a restaurant owner in Russell’s Point; and there they continued to sit. 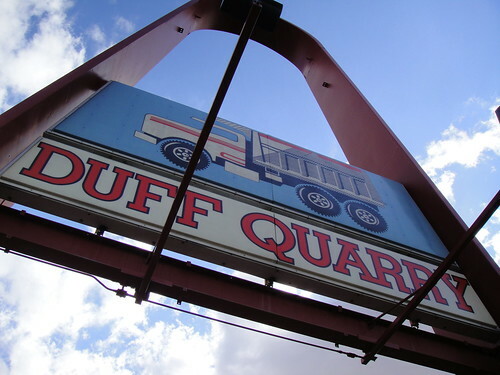 In 1990, Jim Duff, owner of Duff Quarry bought the structures from Anthony Guisliano, the owner at Pier 33, a restaurant in Russell’s Point. 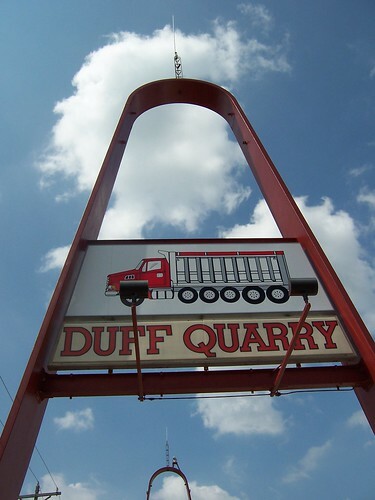 Finally in 1991 the arches were erected in front of the Duff Quarry headquarters in Huntsville, Ohio. It was quite a process to get them up, as Jim relates, “I had to use two 100 pound jacks and a bulldozer to straighten those two pieces, it was a lot of work”. 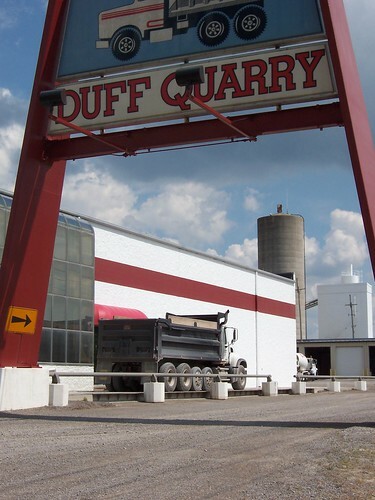 They have been proudly standing ever since outside of the Duff Quarry headquarters. The next time you pass by the arches traveling on State Route 117 remember the hidden history they provide to Logan County.